You’re planning an event or setting-up the program of your theater ? 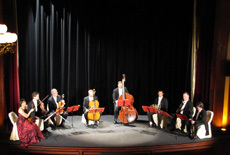 The Octuor de France offers you a magical performance of high quality, whether for a classical concert of chamber music or an original projection-concert. The Octuor naturally fits into your programs, as well as part of a musical season or a festival. In addition to a concert, the Octuor de France can offer « Around a piece » workshops, for both the school to adult audiences. Projections-Concerts, a unique experience ! The magic of the image enhanced by the musicians playing in front of the screen… The rediscovery of the film heritage with original scores commissioned from living composers for each film. The afternoon dress rehearsal can be offered to a school audience. Share a great moment of culture and entertainment thanks to the Octuor de France.